Do not be afraid to use colorful eyeshadow to all over the lid as long as you choose soft colors. As we say goodbye to the cold, grey atmosphere of winter and welcome spring's joyful air, the sun shines brighter, the seas get warm and the number of smiling faces around increases. That is to say, spring comes with its own colors - trees turn green, skies turn blue and flowers turn every color possible. This effect also has an influence on us, the people who enjoy the changes in nature. We open our windows and let the air in, change our closets by bringing our lighter, more colorful clothes out while kicking off the thick and darker ones and spend our weekends outdoors instead of the prison-like malls. Even our diet changes from oily, heavy foods to fresher ones as the fruits enjoy their time of the year. Our makeup habits also get its fair share from this quick shift in life. Although most people prefer to use more natural, earthy tones in their everyday makeup, when everything becomes colorful, suddenly the urge to use color on our face grasps us. However, let's admit, using color is quite tricky, especially as far as the eyes are concerned, since it is out of our comfort zone. Earthy tones are easy to use since they are flattering without much effort and acceptable by almost everyone. Colors, however, are eye-catching, bold, easily raise questions and regarded as unconventional by many. So, how can we incorporate color into our everyday eye makeup while preserving the safety net of the usual? The first easy way to incorporate color into your eye makeup is to turn to eyeliner. Eyeliner defines your upper lash line from beginning to end and makes your eyes pop and look bigger than they already are. If you add a wing to it, a liner can also add an almond-shaped cat-eye look. For all of these benefits, it is one of the most used makeup techniques. However, generally, for daily use, most prefer to use black since it is easy to use and fits all eye colors. Still, a liner of any color can be used and can have a moderate look to it since it is applied to a place that is under the shadow of the lashes. Although it is widely used, eyeliner application can be quite tricky, especially a winged one. In order to make it easier, you can use a piece of tape that is placed from the edge of your eye to the end of your eyebrow. This creates a line for your eyeliner and other eye makeup to follow. Defining your crease is a step that is totally up to you when it comes to colorful eyeliner since it is already quite bold and more than enough by itself. However, if you want to do so, use lighter brown shades with a fluffy crease brush and apply it lightly to your crease. 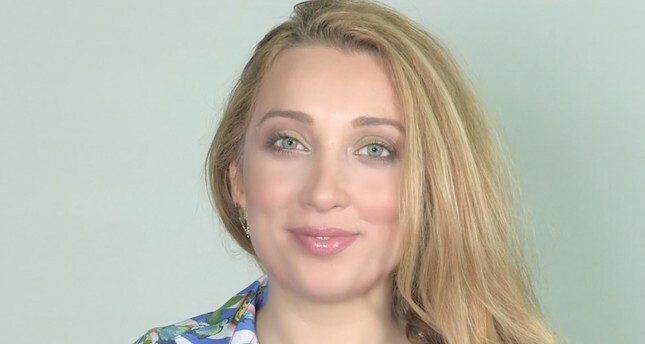 Then, take an eyeliner that can be in any color, shape or form such as a liquid, gel or pencil, which we preferred to use in this makeup tutorial. Draw a line that is as close as possible to your lash line by following the guide that the tape provides to you. If you are using a pencil, you do not have to be so precise since you can always smoke it out with a little liner brush. Smoking it out can also make it more wearable since it creates a faded look. Actually, this is all you have to do to have colored eyeliner that is more different than usual but not as different as to catch everyone's attention. However, you can continue to play with it the way you want. If you want it to look more moderate than it is, you can go over the closest part of your lash line with a black eye shadow to tone down the color you used a bit more. Or, if you are in the mood and want your colorful liner to pop more, you can use a shimmery eye shadow, or liner in the same color and go over it, which would provide you a liner not only colorful but also shimmery. Colorful and shimmery eyeshadows can be used as a highlighter or to emphasize the lower lash line. Another easy way to incorporate color is to draw the inner part of your lower lash line and smoke out the lower lash line itself with a color that you chose. For this look, again, the key is to make everything else but the colorful part to be as toned down as possible. Make your standard, everyday eye look with a little bit of browns in your crease and a champagne or cream color on your eyelids. Then, take a colorful eyeliner pencil since it is more practical to use and go over the inner part of your lower lash line. The main point in this process is to have eyeliner that lasts in the inner part of your eyes, preferably a waterproof one, since our eyes get watery throughout the day. Then, if you want your color to pop even more, go over your lower lash line itself. You do not have to be very careful since again, it will be smoked out to have a more natural, romantic look. In order to tone down some of the color, take a small, slightly dense brush and use an earthy colored eye shadow that you used on your crease before. Then, start to smoke out your lower lash line gently. However, be careful to not go too low on your lash line, since it may pull down your eyes. Last but not least, in order to incorporate color to your eye makeup, you can use any colorful eye shadow all over your eyelid instead of a pop of color in your eyeliner or smoked out lower lash line. Although it seems shocking and risky at first, actually it is not as scary as it sounds. The key is to choose eye shadows that have the lighter version of the color your chose. For instance, if you want to use greens, use a light green eye shadow instead of an army green. Any color would look friendlier in their lighter forms, trust me. However, shimmery eye shadows tend to look more toned down than matte ones, which is why they can be more useful for this particular look. This is also a good start to move into smokier, darker colorful eye shadow looks if it is something that you wish for yourself in the future. You can make yourself use to it slowly but gradually, from lighter to darker. For this look, first, define your crease with natural colors as you did for the other two methods. Then, darken the outer part of your eyes with another natural color that is slightly darker to enclave the colorful shadow that will be applied next. This step would make the colorful eye shadow look less scary and more natural. Lastly, go get your moderately colorful eye shadow and apply it all over your eyelid. You will see that it looks way more usable than it looks when it is swatched. Still, even if this toned-down eye shadow color is too much for you, you can tap the very middle part of your eyelid it with a light, creamy or champagne shimmery color to make it look even more conventional. As a last step, go over your lower lash line with the earthy colors that were used in your crease before to emphasize the enclave of the colorful shadow even more. Here you are using colorful eye shadow all over your eyelid without any concerns. When you are using color in your eye makeup, try to keep the rest of your makeup as simple as possible. Do not back down from using natural colors for your blush, highlighter or lipstick while also using them light handedly to keep the attention still on the colorful eye look. When it comes to makeup, do not refrain from trying new things. Go out of your comfort zone, explore your taste and combine it with your talent. Use your face as a canvas to express yourself. Don't forget, in contrast to many things in life, makeup does forgive mistakes and can be cleared off easily as if it has never happened.